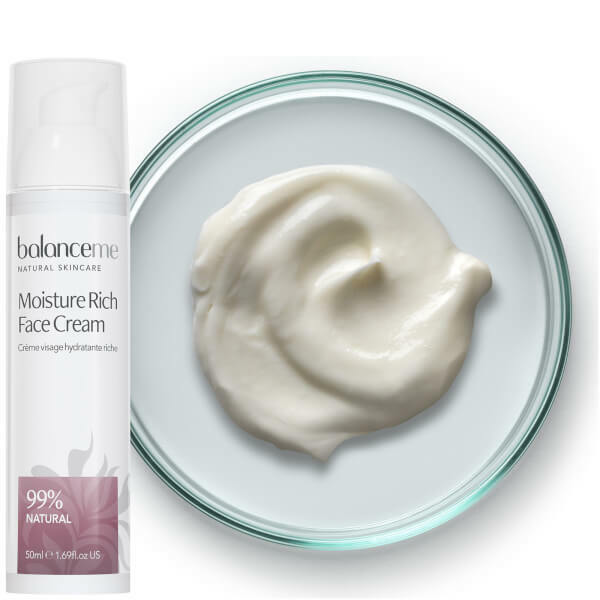 Replenish dry, thirsty skin with the Balance Me Moisture Rich Face Cream; a lightweight, quick-absorbing formula that works to hydrate, plump and improve elasticity. 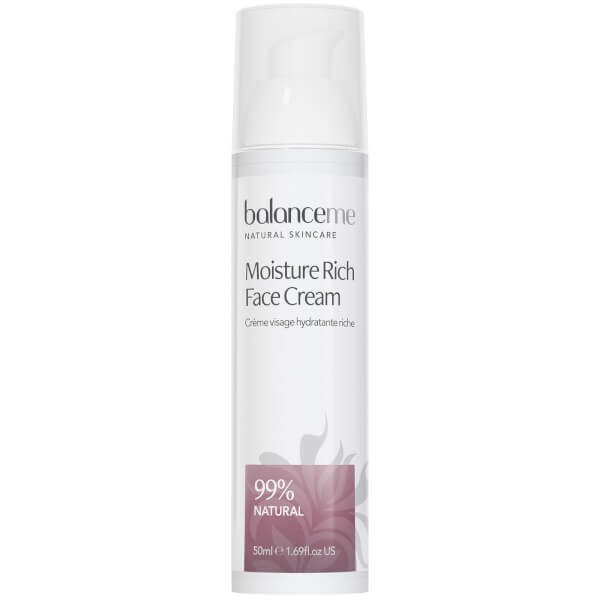 Harnessing the powers of Organic Shea Butter, Rosehip Oil and antioxidant-rich Arctic Cloudberry, the rejuvenating moisturiser creates a veil of hydration over skin for a silky soft, comfortable finish. 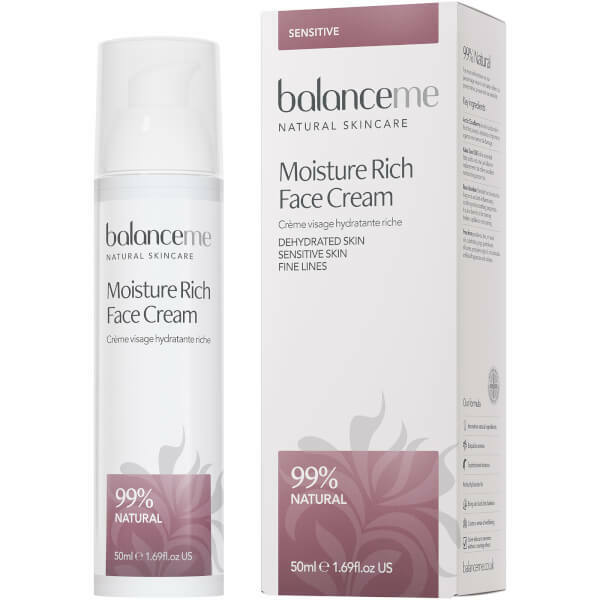 Expect a smooth, firm and healthy-looking complexion with renewed radiance. Aqua (Water), Butyrospermum Parkii (Shea) Butter³, Glycerin (Vegetable), Simmondsia Chinensis (Jojoba) Seed Oil, Glyceryl Stearate SE, Cetearyl Alcohol, Cetyl Ricinoleate, Polyglyceryl-3 Dicitrate/Stearate, Aleurites Moluccana (Kukui) Seed Oil, Camellia Oleifera (Camellia) Seed Oil, Rosa Canina (Rosehip) Fruit Oil, Rubus Chamaemorus (Cloudberry) Seed Extract, Aloe Barbadensis (Aloe Vera) Leaf Extract³, Pelargonium Graveolens (Rose Geranium) Flower Oil¹, Rosa Centifolia (Rose Absolute) Flower Oil¹, Citrus Limon (Lemon) Peel Oil¹, Styrax Benzoin (Benzoin) Resin Extract¹, Chondrus Crispus (Carrageenan), Rosmarinus Officinalis (Rosemary) Extract, Tocopherol (Vitamin E), Helianthus Annuus (Sunflower) Seed Oil, Vitis Vinifera (Grape) Seed Oil, Sodium Stearoyl Lactylate, Benzyl Alcohol, Dehydroacetic Acid, Potassium Sorbate, Citric Acid, Citronellol², Geraniol², Linalool², Citral², Limonene², Eugenol², Farnesol², Benzyl Benzoate². (¹) natural pure essential oil, (²) naturally occurring in essential oils, (³) certified organic ingredient.